Frank Vincent Zappa[nb 1] (December 21, 1940 - December 4, 1993) was an American musician, composer, activist and filmmaker. His work is characterized by nonconformity, free-form improvisation, sound experiments, musical virtuosity, and satire of American culture. As a self-taught composer and performer, Zappa's diverse musical influences led him to create music that was sometimes difficult to categorize. While in his teens, he acquired a taste for 20th-century classical composers such as Edgard Var? ?se, Igor Stravinsky, and Anton Webern, along with 1950s rhythm and blues and doo-wop music. 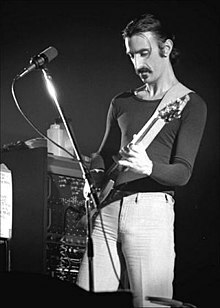 Zappa's output is unified by a conceptual continuity he termed 'Project/Object', with numerous musical phrases, ideas, and characters reappearing across his albums. His lyrics reflected his iconoclastic views of established social and political processes, structures and movements, often humorously so. During Zappa's lifetime, he was a highly productive and prolific artist with a controversial critical standing; supporters of his music admired its compositional complexity, while critics found it lacking emotional depth. He had some commercial success, particularly in Europe, and worked as an independent artist for most of his career.